Since 2009, P.A.I.R has offered temporary residence for international artists. Selected artists make a given theme their starting point, relating to their surroundings and neighbours, making use of their knowledge, art and tools. 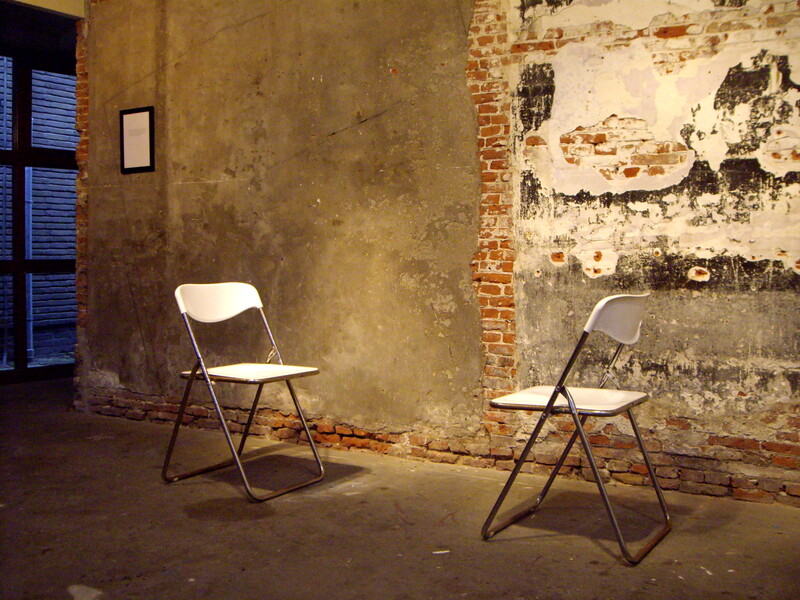 In 2010 the theme was chorography and I was invited by Henry J. Alles from P.A.I.R to write about this subject in relation to the specific residency of Louie+Jesse, an English artist duo. 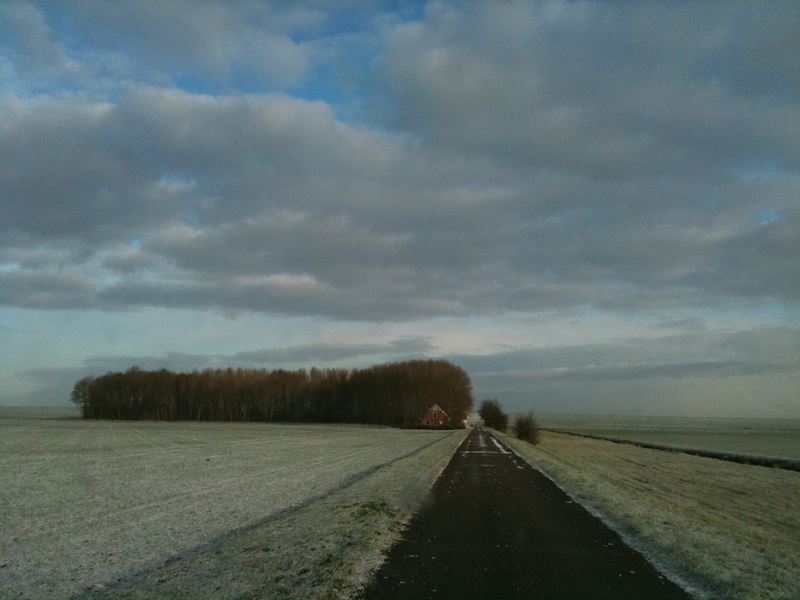 The resulting text: When The Landscape Begins to Map The Cartographer will be published in the publication P.A.I.R. 2010 Chorografie and on this website after the 4th of March. 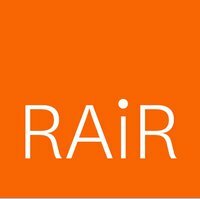 RAiR presents a selection of Rotterdam Artist’s in Residence from the past 10 years by Duende, foundation B.A.D., Het Wilde Weten, Kaus Australis and Kunst&Complex. Curated by Leo Delfgaauw. Sat. Feb. 12 noon – 6pm / Hillelaan 28, Rotterdam. Inside ADA’s Cabinet, Meet, discuss and interact with artist initiative ADA, Area for Debate and Art. The members of ADA will discuss their archive of lectures and other public projects by using artefacts and objects as mediators. ADA is a self-organized, independent artists initiative formed in September 2008 to support, nurture, stimulate and to create space for critical reflection and debate in and about art, in an open, cross-disciplinary minded and a friendly environment. At the core of ADA are the art practices of six Rotterdam based artists (Maja Bekan, Deirdre M. Donoghue, Gerwin Luijendijk, Margo Onnes, Esmé Valk and Sjoerd Westbroek) who also run ADA’s public program. ADA is as much a mental state as it is a physical location. It can be thought of as a multifaceted, porous sphere, consisting of people, thoughts, ideas, knowledge and experience/s, which flow in and out from the Area. A common philosophy of the members of ADA is the simple belief in the value of specifically framed human encounters as artistically meaningful and valuable sites, where new knowledge can be activated and allowed into being. Deirdre M. Donoghue, (Finland,1971) is an artist based in Rotterdam. In her works she seeks to set-up situations where multiple relations can be set into motion and the production of new knowledge through cross-disciplinary methods and approaches become mobilized. Her video, performance, installation and text -works often focus on the relational aspects of memory production, cultural translation and the production of a Self. Additional research interests include: feminist issues, performance- and gender studies. She is the organizer of the program The Open Office for Words, which hosts talks, research presentations and discussions within a cross-disciplinary framework, a contributing editor of the publication Resonant Bodies, Voices, Memories, Revolver, Archiv für aktuelle Kunst, Frankfurt and The Piet Zwart Institute, Rotterdam and a founding member of ADA, Area for Debate and Art. Donoghue considers the performative as; reality producing relation between memory, its documentation and its representation. She will look at art works that deal with memory production and the production of subjectivities. 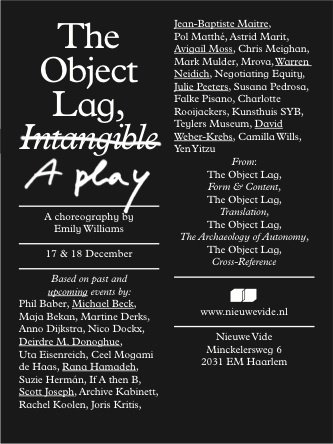 The 2010 programme of Nieuwe Vide draws to a close on the 17th and 18th of December with The Object Lag Intangible, a Play. Guest curator and artist, Emily Williams enters a working period in collaboration with performance artist, DavidWeber–Krebs, artist and theoretician, Warren Neidich and artist,Deirdre M. Donoghue. Reflecting on the past year and departing from the question; How can The Object lag be documented without fixing it? Williams devises a choreography that opposes bringing The Object Lag to a prescribed end, but rather, sets it in motion as a possible beginning. Including presentations byMichael Beck, Rana Hamadeh, Scott Joseph Jean–BaptisteMaitre, Julie Peeters and guests. The Object Lag. / Nieuwe Vide, Haarlem. A Brief History of Play is a light tour into the interrelated history and relationship between play and education. During the tour emphasis is given on the activity of play itself and the participants are invited to play, instead of engaging in the topic on a purely conceptual level. On October 23rd, 2010, Kunsthuis SYB celebrates its 10th anniversary with a symposium and a party. The symposium ‘Our House in the Middle of the Street’ concentrates on subjects that were brought up by the diverse projects that took place in SYB since the start of the residency, formulated along the lines of the various uses of the house. Six guest speakers will reflect on the themes ofNesting, Hospitality, Open House, Social Politics,Playground Structures and Private / Public, aiming to open up discussion and focus on the issues raised within them, to establish a relation with a broader contemporary art theory scene with special attention for project art. Kunsthuis SYB will function as a performative playground, hosting cross-disciplinary speakers and guests conversing on various locations in Beetsterzwaag and the house itself. The symposium will be available to all online through Live Streaming. At the evening party various performances will be given by artists who recently worked in SYB. A tour bus between Rotterdam, Amsterdam and Beetsterzwaag will service guests from afar. Register viainfo@kunsthuissyb.nl. ‘Our House in the Middle of the Street’ is developed by Maja Bekan and Irene Kromhout, artists and member of SYB’s programming committee, with the generous support of the Artclub and Maartje Peters, coordinator. Sarah Bogers is responsable for the graphic design. Daniëlle van Zuijlen, visual artist and curator, founder of the artist-run initiative Hotel Mariakapel. Deirdre M. Donoghue, performance ‘Kitchen lecture’. Ana Nikitovic, curator Museum of Contemporary Art Belgrade, participant ‘de Appel Curatorial Programme’ 08/09, member Prelom Kolektiv. Aymeric Mansoux: Core tutor Piet Zwart Institute Media Design and PhD researcher on online art and design communities Goldsmiths U.K.
Frans-Willem Korsten, cultural theorist, professor Erasmus University Rotterdam and Leiden University. Emily Williams, artist and curator, former member of Kunsthuis SYB programming committee, guest curator Nieuwe Vide. Performance Event: Who Stole The Tarts? With performances by Deirdre Donoghue, Roxane Borujerdi, Hedwig Houben, Abner Preis and an appearance by The Dogs of Shame. Absurd attributes, unusual contexts and unyielding perspectives in four performances in which the traditional lecture is put to the test. Each of the four artists provide insights into new strategies for the acquisition of knowledge in an evening without the classical division of roles between a passive public and an active speaker. The performance event is part of the exhibition Enigma (29.04 – 27.06) with work by Lorenzo Casali, Martina Florians, Marcha van den Hurk, Juul Kraijer, Joris Kuipers and Lieke Snellen. In May, The Open Office For Words returns to its original format of a reading room and a collective library, serving fresh coffee, tea and cakes. The theme for May: Performativity in the arts and related fields. The theme for May is performativity and texts considering relations between performance, identity and performativity in the fields of arts, philosophy, media and gender studies are welcomed. Thinking About Performativity begins a series of sessions relating to aspects of performativity as they present themselves in the work of the participants. You are cordially invited to search through your resources and to see whether you perhaps might have something to contribute to the above themes. 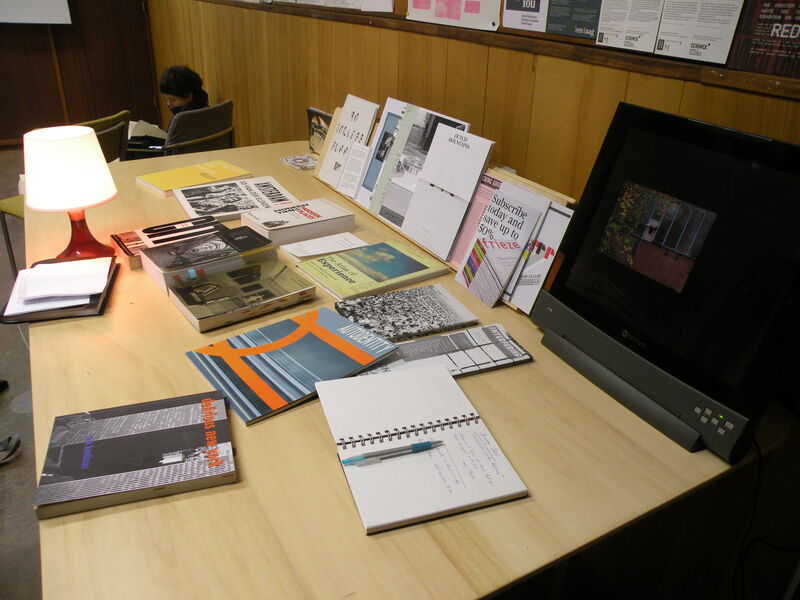 Books, journals, research papers and images related, whether from the field of arts or science are all welcome, as are art-works, documentaries and interviews in a dvd-format. ‘She told me not to wear it’ zegt de vrouw op de stoel tegenover me. ‘It was metal, rounds and squares, all connected, and I lost it.’ Ze is zichtbaar aangedaan, maar het volgende moment spreekt ze alweer vrolijk als een kind en even begeesterd van sneeuwpoppen die dezelfde vorm hebben als de vlek op de grond. Dat wat op een associatieve manier aan mij en de directe omgeving herinneringen oproept, spreekt Deirdre M. Donoghue uit. Ik sta op uit de stoel en de herinneringenstroom stopt. ‘Performing Memory’, zoals de performance heet, is onderdeel van de presentatie van de Fins-Ierse kunstenaar Deirdre M. Donoghue bij Kunsthuis Syb. Donoghue studeerde o.a. dramaturgie en fotografie in Ierland en behaalde in 2007 een MA diploma aan het Piet Zwart Instituut in Rotterdam. Hoe herinneringen werken, hoe ze hun weg zoeken naar de alledaagse realiteit en die vinden in onze taal en gedrag, om deze op hun beurt te vormen, zijn vragen die centraal staan in Donoghue’s recente werk en in deze tentoonstelling. Zowel voor kunstenaars en cultuurhistorici is het zogenaamde ‘cultural memory’ in de afgelopen decennia een inspirerend onderwerp en onderzoeksgebied gebleken. De relatie tussen het persoonlijk beleefde en het cultureel geconstrueerde is een van de vele aspecten van de culturele herinnering, die ook in het werk van Donoghue een centrale plek inneemt. Deze achtergrond doet sterk theoretisch aan en kan de drempel voor de spontane bezoeker van Kunsthuis SYB verhogen. Toch hoeft dat niet zo te zijn. Mijn ervaring van ‘Performing Memory’ is in eerste instantie hoogstpersoonlijk. Donoghue’s herinneringen klinken mij dan als betekenisvolle poëzie in de oren, dan juist als kinderlijke verhaaltjes zonder werkelijke kop en staart. De ervaring is intiem en lijkt een blik te werpen in de psyche van de persoon tegenover mij. Ik vraag me af of het waar is wat ze zegt. Zijn dit haar werkelijke herinneringen of is het een aangepaste variant van het surrealistische automatisch schrijven? Haar woorden maken me wat ongemakkelijk en overdreven bewust van mijn eigen aanwezigheid, daar zittend, luisterend. Maar, ze maken me ook bewust van de vragen die het oproept. Zijn haar herinneringen, is een herinnering, waar? Wat zegt een herinnering eigenlijk over de werkelijkheid? En hoe vormt deze de werkelijkheid? Een interessante wisselwerking ontstaat tussen kunstenaar en beschouwer, die niet slechts een actief – passief tegenstelling is. Voor een seconde lijkt de werking van de herinnering concreet te worden in de vorming tussen twee personen die de herinnering in het hier en nu sturen. Drie weken na de performance bezoek ik de eindpresentatie van Donoghue, welke bestaat uit twee videowerken en het zogenaamde Open Office for Words, een doorlopend project waar de kunstenaar een bijeenkomst organiseert over een specifiek thema, in dit geval ‘Constituting Reality, Does the medium make the memory’ en diverse sprekers uitnodigt om hun ideeën uit te wisselen aan de hand van meegenomen boeken, onder het genot van taart en koffie. In de video ‘Kitchen Lecture: notes on gesture’ zien we de kunstenares die tijdens het bereiden van de maaltijd een lezing geeft over gebaren. Het wordt een warboel. De zware kost van de lezing lijkt een zichtbare strijd aan te gaan met de huiselijke omgeving van de keuken, waar het dochtertje spreekwoordelijk roet in het eten gooit. Ze speelt met het hete rooster en saboteert de afspeelapparatuur. Ondertussen blijft Donoghue volhardend doorgaan en jongleert ze haar identiteit als kunstenaar en als moeder. Het werk dat centraal staat in de eindpresentatie is ‘A certain capacity for occupying space’, waarin Donoghue vijf vrouwen filmt, die drie jaar geleden in Londen hetzelfde kunstwerk zagen. Het kunstwerk wordt niet met naam en toenaam genoemd en elke specifieke referentie eraan is uit de opname geknipt (hoewel het voor enkelen ook aan de hand van de summiere informatie bekend zal zijn over wie en wat hier gesproken wordt). Drie jaar na dato vraagt Donoghue de dames hoe de ruimte eruit zag? Wat hun verwachtingen waren? En waaruit het kunstwerk bestond? Ze herinneren zich een witte ruimte, sommigen noemen specifiek het bureau of de boekwinkel die zo prominent aanwezig waren. Ze beschrijven alle vijf hoe ze een ruimte binnen treden en daar een groep kinderen zien. Volgens de een rennen de kinderen rond, volgens de ander zijn ze heel gelukkig en vrolijk. Weer een ander benadrukt dat ze een school uniform droegen, terwijl de ander er van overtuigd is dat ze juist hun eigen kleiding droegen. Een van de kinderen maakt zich los uit de groep en spreekt de bezoeker aan. Maar wat ze exact zeggen? Dat lijkt niemand zich drie jaar later nog exact te herinneren en blijft in de film onuitgesproken. Het resultaat van A Certain Capacity.. is een archief van vijf ooggetuigenverslagen. In eerste instantie lijkt de video het cultureel geheugen te concretiseren door letterlijk te vragen naar de herinnering van een culturele uiting. Visueel summier, geabstraheerd van associaties, reflecties en duidelijke verwijzingen, lijken alleen de veronderstelde feiten – en hoe deze door de geïnterviewden worden overgedragen – te worden vastgelegd. Maar tegelijkertijd toont de film zijn eigen problematische karakter. Niet alleen spreken de geïnterviewden elkaar soms tegen. Ook wordt duidelijk dat ze elk als het ware op een actieve wijze hun eigen realiteit vormen. Daarmee wordt blootgelegd hoe culturele herinneringen, met hun overduidelijke subjectieve aard, tegelijkertijd een feit en fictie zijn, actieve constructies van het verleden in het heden zijn. In de woorden van de titel, een zekere capaciteit hebben de ruimte in te nemen. Het lijkt alsof Donoghue de werking van het geheugen, net zoals bij ‘Performing Memory’, voor een seconde weet te grijpen en vast te leggen, om vervolgens te laten opgaan in een zee van vragen. Hoe verhoudt de individuele ervaring zich tot de algemene culturele herinnering? Welke waarheid legt dit archief van ooggetuige verslagen vast? Donoghue toont ons de culturele herinnering als drijfzand: ogenschijnlijk concreet, maar vervaarlijk vloeibaar onder de oppervlakte. De stroom van culturele herinneringen draagt bij aan de vorming van realiteit en identiteit, zoals ook het Kunsthuis SYB met de uiteenlopende culturele uitingen, in nagedachtenis van Sybren Hellinga, zich telkens opnieuw een plaats verwerft in het collectieve bewustzijn van Beetsterzwaag en bijdraagt aan de culturele identiteit. Donoghue geeft ons geen antwoorden, maar toont ons de gelaagdheid van de herinneringenstroom en hoe deze altijd in beweging is, nooit statisch is, nooit af. Ook de herinnering van de performance en presentatie bij SYB vloeit door in deze recensie en zal hopelijk vele nalevens krijgen in het geheugen van de lezer.